Enjoy the nostalgic aroma of neroli and rose hydrosols. Spray the Pure Anada Garden Facial Mist on your skin to sooth, hydrate and refresh. Great for all skin types. Directions: Spray directly onto your face (or body), after cleansing and before applying mineral makeup. I love this product, smells great and Neroli has calming properties to it. However the spray on the bottle I bought was very strong, I prefer a 'mist' more to a 'spray'. No problem though as I had my old toner spray bottle and transfered some in there. I am late 20s, have dry-oily combination skin, and Im always looking for products that don't completely dry me out or moisturize so much it feels slimy. 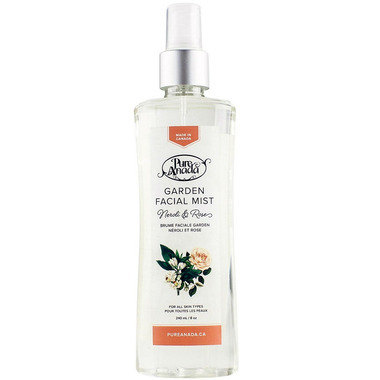 This is a lightweight facial mist that I spray on my neck, chest and face before bed. It makes me feel so smooth and hydrateÄ�. I haven't tried it before/after makeup application yet but I'm confident it will help set it nicely. It smells just like roses and I recommend this 100%.